I build houses like that one but they are for squirrels and also for owls. I suppose anything can use them. If you shoot the other side, there should be a round hole for an opening that is 4 inches in diameter. I do it to help nature as the trees that are hollow are removed here by the city to escape possible law suits from falling trees and tree parts. 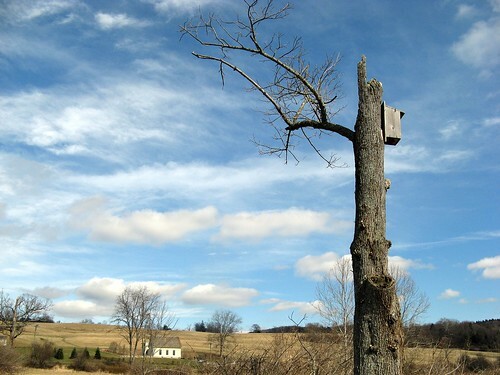 Anyway, it looks like a squirrel box also used by owls, especially the little screech owls. Shows what a different angle can do to a photograph. It's so light and clear.Nive work. ta série de paysage est superbe. j'adore. Your series of scenery is superb. Very good.